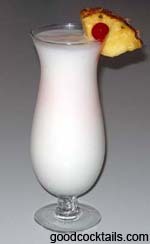 In a blender combine the rum, piña colada mix and pineapple juice with crushed ice. Blend well at high speed and pour it into a hurricane or collins glass. I like to use Malibu® to add more coconut flavor. You could use a hurricane glass or a collins glass for this drink.